It seems so much easier to admit some of our silly, little habits when we find people who operate the same way. My mom was one of the biggest coupon people I know. She loved cutting out coupons and taking them to the store to redeem them for cash. The stores weren’t nearly so sticky all those years ago and they would dole out cash for your coupons whether you bought the product or not. My mom loved this little practice because money was tight in those days and this coupon money ended up being her extra cash to spend the way she saw fit. I’m a coupon clipper. There’s no getting around this fact. The other day when I went to the local pharmacy with my wallet full of coupons, I got a bunch of excellent deals. When I jumped in the car and looked in the mirror, I realized I had become my mother. Oh my, I could hardly believe it. I not only look like her, I’m now doing the same darn thing. The scary part about it is that the realization crept up on me in such an unexpected way that it brought a smile to my face. I don’t really need to engage in this habit. I’m not in the same position my mom was all those years ago, so why do I do it? I’ll tell you why! I have a group of friends that I socialize with and guess what? We all do the exact same thing. It’s actually hilarious. It’s a wonderful game that we all seem to enjoy. 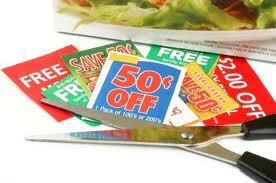 We go shopping and to restaurants with our handy coupons. Buy one meal, get one free has been the deciding factor in many of the restaurants we frequent. There is even a half-price day at the local movie theater. Our husbands have started to be as hooked as we are and they are cooperating to the fullest extent. Usually you can only purchase one item per coupon, so the “guys” sometimes join us so that they can use a coupon too. You know how much these men like to go shopping but yet somehow or other we get them to come along with us so we can benefit from two coupons instead of just one. As I’m writing this and trying to describe this habit of ours, it makes me want to burst out laughing. Here we are…all excelling in the art of being thrifty. We are so proud of our bargains. When we’re gone and leave our children their inheritance, if there’s any to be had, I’m sure they’ll spend it faster than you can “shake a stick” and probably without a moment’s hesitation. We’ve had a blast saving our money. Hopefully, our children will have as big a blast spending it! What do you think?